As I have reported in other posts, Washington seems content on playing political games with the issue of deficit reduction and the debt ceiling even if it means risking endangering the full faith and credit of the United States. As we watch this silly game of chicken unfold, we might look at a couple of ideas for ways to reduce the deficit and create jobs that are well worth considering. The first comes from the Brookings Institution. The second is offered by the Center for American Progress. First up, Brookings. Brookings: Use offshore companies’ profits to rebuild American infrastructure and create jobs. Brookings points out something just about everyone knows. American needs to invest in rebuilding its infrastructure. “We need someone to invest hundreds of billions of dollars into for-profit trains, roads, airports, clean electricity generation, high-voltage transmission lines and more.” The nation’s commercial buildings and residential housing “could be improved in quality by replacing windows, insulation and monitoring systems, which save more in energy spending over time than would be spent on the renovations.” There is a lot we can do that would pay real dividends in the future while putting a lot of people to work in the short-term. Unfortunately, no one in Washington seems interested in spending any money on infrastructure. In fact, the Republicans are trying to make drastic cuts in the little infrastructure spending that remains in the budget. So, what can we do about rebuilding American when there is no political will to do anything? Brookings suggests that we could easily grab hold of more than $1 trillion for infrastructure improvement. How? Why not, Brookings asks, make American companies sitting on this stack of cash an offer? We would let them bring this money home tax free if they agreed to invest in a national infrastructure bank for a given period, say five to ten years. The infrastructure bank would use the money to make low-interest, long-term loans for infrastructure improvement. In short, U.S. overseas profits would come back to be used to rebuild America. American companies would get to avoid taxation and the country would get the funds it needs to rebuild. Brookings estimates that an infrastructure bank capitalized with $100 billion from company overseas profits could finance projects, combined with private capital, worth $1 trillion. The $1 trillion could create 10 million jobs between now and 2020 which would be nearly half of the 21 million new jobs we need to reach full employment by the end of this decade. The Center of American Progress (CAP) has taken a look at the existing tax code and has found more than $1 trillion in hidden tax-code spending—i.e., tax breaks, called tax expenditures. 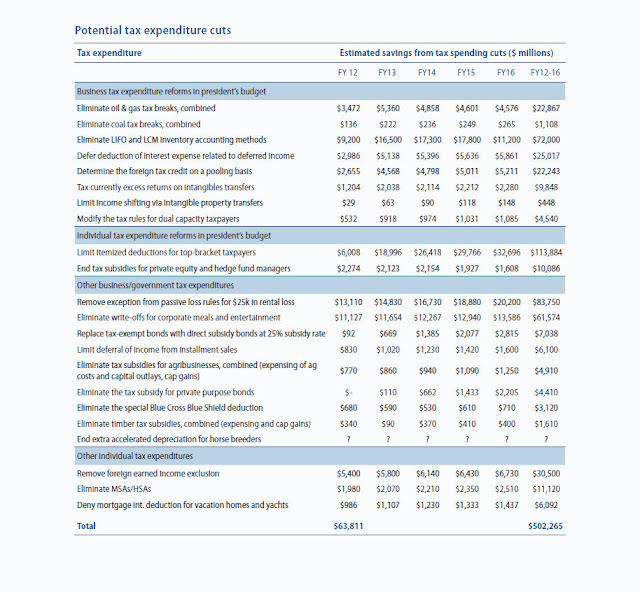 In their report, CAP identifies individual tax-code spending cuts that amounting to $64 billion in FY 2012 and $502 billion over five fiscal years. The table below lists the tax expenditure savings CAP found. You might be surprised at some of the tax breaks. For example, did you know that private equity and hedge fund managers, those guys who created the financial meltdown, get a tax break that allows them to pay a lot less tax on their income than you have to pay on yours? Did you know that while most health insurance companies have to pay income tax on their profits, certain Blue Cross and Blue Shield providers get a special deduction that significantly lowers their tax liability? Did you know that timber companies and horse breeders get a special tax breaks other businesses and individuals don’t enjoy? Did you know that American citizens working overseas get to exclude up to $92,900 of earned income even if they pay little or no foreign taxes? Did you know that those health savings accounts (HSAs) that Republicans love actually primarily benefit wealthy individuals who use them as a tax shelter? Also, HSAs end up raising health insurance costs for everyone because they draw younger and healthier individuals into high-deductible plans. Finally, did you know that rich people get a tax break for interest they pay on mortgages they use to buy expensive vacation loans and loans they take out to purchase yachts? Cutting wasteful tax expenditures is an idea well worth considering. Think about it.